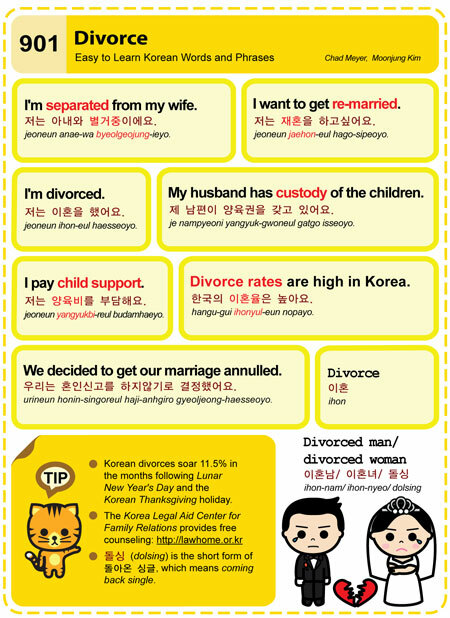 Easy to Learn Korean 901 – Divorce. This entry was posted in Series and tagged anulled, child support, children, custody, divorce, divorce rates, divorced, divorced man, divorced woman, dolsing, husband, Korea Legal Aid Center, re-married, separated, wife, 돌싱, 우리는 혼인신고를 하지않기로 결정했어요, 이혼, 이혼남, 이혼녀, 저는 아내와 별거중이에요, 저는 양육비를 부담해요, 저는 이혼을 했어요, 저는 재혼을 하고싶어요, 제 남편이 양육권을 갖고 있어요, 한국의 이혼율은 높아요 by easykorean. Bookmark the permalink.